In terms of family structure, both residents and transients live in matriarchal societies, with individual groups led by elder females. 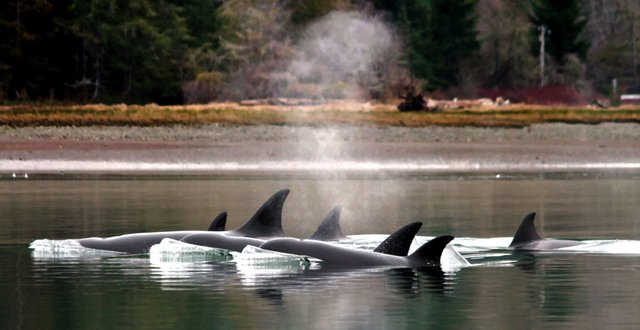 For the most part, resident orcas will stay with their moms for life. Young whales will often be found with their extended families, including aunts, uncles and cousins and quite often their grandmothers and even great-grandmothers if they are still living. Traditionally, multiple matriarchal groups — known as matrilines — come together to form larger pods. Together, the residents hunt for schools of salmon by working together in these extended groups. Transients often travel in much smaller groups, perhaps because they hunt individual seals and sea lions, making the smaller groups more efficient. Younger females generally stay with their mothers until they have calves of their own. The confusion comes in because an adult female with multiple calves may be seen swimming with her mother at times, but leading her own little group at other times. With various families doing different things and going different ways, transient groups are hard to define. During the month of April, about 20 different transient groups were positively identified in the Salish Sea, according to Orca Network. That does not count any groups seen by ordinary observers unable to identify the individual whales. For the month, 442 killer whale sightings were recorded — mostly of transients, although J pod was around for part of the month, according to data from Orca Network. And, going into May, the rate of sightings does not seem to be slowing down. In comparison, sightings totaled 275 during April of last year. The number of transient orcas spending time in Puget Sound is definitely growing, said Deborah Giles of the Center for Whale Research, while acknowledging that some of this year’s increase may be the result of more people out watching for whales from shore. Sighting locations are provided by both Orca Network and a separate group, The Whale Trail. Another unusual observation, Giles said, is the congregation of small groups of transients into 20 or more whales, something seen last year for the first time in Puget Sound and experienced again this year. Many of the whales we see range widely from Northern California to Southeast Alaska. In 2005, I was thrilled to talk to Dena Matkin, a whale researcher in Glacier Bay, Alaska, who was familiar with six orcas that had been hanging around in Hood Canal. Puget Sound experts had identified the two older females as T-71 and T-124A, as I reported in the Kitsap Sun, Feb. 5, 2005. It is interesting to note that the T-71 group was seen in January of this year at the southern tip of Vancouver Island in Canada. The T-124A group was seen within the Salish Sea in January, March and four times in April. T-124A was among a group of 28 transients gathered in the Strait of Georgia on April 14. In the 1970s, during the early days of killer whale research, Michael Bigg of Canada’s Department of Fisheries and Oceans figured out that individual whales could be identified by the shape and size of their dorsal fin along with pigmentation at the base of the fin, called the saddle patch. Eventually, the researchers in Puget Sound and British Columbia realized that two large groups of orcas were seen again and again. They eventually became known as Northern Residents and Southern Residents. In those days, researchers documented other whales coming into the inland waterways, but few would be seen a second or third time. Bigg called these whales transients — although some people now refer to them as Bigg’s killer whales in his honor. For a nice account of this history and other information about transients, check out a piece by Jared Towers in Orcazine, an online magazine about killer whales. It is now understood why transient killer whales were rarely seen in the Salish Sea before passage of the Marine Mammal Protection Act in the U.S. and similar laws in Canada. Seals and sea lions had been hunted to extremely low levels before 1972 in an effort to increase the commercial harvest of salmon. What isn’t clear is why it took the transients so long to figure out that marine mammals were back on their exclusive Puget Sound menu. A study by Juliana Houghton of the University of Washington and other researchers describes an increase in transients in the Salish Sea from 1987 to 2010, but it appears that the whales’ presence has grown much more since that time. Total populations of West Coast transients are hard to calculate, but the rate of growth has slowed since an initial surge from 1975 to 1990. The best estimate for today’s population is more than 500 animals. Gary Wiles of the Washington Department of Fish and Wildlife produced a Periodic Status Review (PDF 3.1 mb) last summer. I should mention that through the years many observers have secretly or even openly hoped for a resurgence of transients in the Salish Sea to benefit the Southern Residents. Seals and sea lions are often direct competitors for the salmon needed to keep the endangered Southern Residents alive. Seals and sea lions eat lots of other fish as well, complicating the relationship. Check out a story I wrote in January for the Encyclopedia of Puget Sound. Because the resident and transient populations remain isolated, they have developed their own hunting styles, with the transients being generally quieter to sneak up on seals and sea lions. Meanwhile, the residents not only make more noise as they go after chinook salmon, their repertoire of calls is more complex and extensive. Physically, transients are larger, presumably because their prey — marine mammals as opposed to fish — are larger and stronger. This is likely evolution at work. The dorsal fin of a female transient is sharper and looks a little like a shark fin, whereas a female resident’s dorsal fin is generally more curvy. The saddle patch of the two types is also different, with residents having more variation in shape and shading. If you would like to identify individual transient killer whales, Orca Network has posted a catalog of photos (PDF 116.3 mb) produced in 2012 by Canada’s Department of Fisheries and Oceans. A newer catalog, in color, was compiled for members of the Center for Whale Research. Welcome Transients………the seal population has become ridiculous….chow down so the Resident Pods will have a couple great feeding seasons.